16 short devotions helping Christians to see where and how they can grow in their faith and joy. 1. What is spiritual health? Everyone needs a check up every now and then and Carl gives us a terrific little spiritual health check here. It helps us see where we may have drifted and then balances that out with Biblically helpful encouragement to get back on track. Here are helpfully penetrating questions and a lovely encouragement that although there are no quick steps to a thriving Christian life, we have all we need in Jesus and the ordinary means of grace. Carl Laferton has provided a gift to the church in encouraging believers to see how God is working and providing hope for change. Like many believers, I have often wondered if I am growing as a Christian. The daily pressures of life, coupled with my own sin, can make it difficult to see the work that God is doing. "Spiritual Healthcheck" is a needed tool designed to help believers diagnose and treat their own spiritual health. Great to read with a friend or read it on your own. 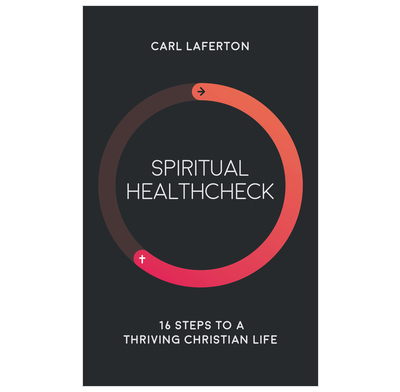 In this helpful and highly readable book Carl Laferton offers a spiritual healthcheck suitable for use by individuals, small groups or whole churches. Drawing on themes from across the Bible, and with the gospel at its heart, here is a book that diagnoses and prescribes offering realistic and practical encouragements for spiritual health and vitality. I used this last January when it was in the Explore notes and found it so helpful and practical and bought 3 copies of the book for friends when it was published. A great book to help us in our walk with God. I found this spiritual checkup so good and helpful when it was in the Explore notes last January so was delighted to see it published in book form. I bought three to give to friends and they’re pleased as like everyone we all struggle at some time in our walk with God. I highly recommend this book which reminds us of what the Lord Jesus has done for us and encourages us to keep going in a clear, practical and helpful way. Just bought this and received it in the post. Unpacked it, thought, "that looks interesting" and then got so caught up in it I have in fact skimmed through it cover to cover. Looks terrific! Certainly one for church ministers to apply to themselves and give away in congregations... Really helpful, concise and clear.